Exactly How Far Is New York From Being a Dominant Sports Town? Last night, the Bruins won the Stanley Cup, becoming the fourth Boston-area sports team to win a championship since 2005, when the Patriots beat the Eagles in Super Bowl XXXIX for their third title in four years. (Since then, the Red Sox have won a World Series — it was their second in four seasons — and the Celtics have won an NBA title.) It's a pretty incredible run for a single city — particularly one that had so little going for it over the previous fifteen years and once invented a curse to explain its baseball team's shortcomings. New York considers itself the capital of the world, but we are not, right now, the capital of the sports world. So exactly how far away is New York from the type of feat Boston just pulled off? If the goal is a title in each of the four major sports, New York has one built-in advantage: It has two teams in two of those four sports, and soon will have a second team in the NBA as well. (We won't count the Devils and Islanders, who strongly identify with New Jersey and Long Island respectively.) And we're already halfway toward a superfecta within the last five years. But the question is not only how competitive our teams have been in recent years  it's also how much we trust them to remain so in the future. New York's most recent football title was 2008, and odds are decent that there could be another relatively soon. The Jets have reached the AFC title game two years in a row, with a young quarterback who will presumably (hopefully) improve. They're a franchise moving in the right direction, with a core of players they can build upon. And although the Giants missed the playoffs last season, they've got good owners and a capable front office, which makes a big difference. Consider this: The Giants reached the Super Bowl in 2001, revamped virtually their entire roster over the next few seasons, and made it back just seven years later. They may not be as close as the Jets right now, but the future is hardly bleak. New York's baseball prospects are also solid. The Yankees won the World Series two years ago, reached the ALCS last year, currently have the third-best record in baseball, and have been consistently competitive for more than fifteen years now. And even as the current roster ages, the Steinbrenners' checkbook allows them to reload as necessary. The Mets, on the other hand, have a much longer way to go: They have capable management in place — but their finances are a question mark as they enter this rebuilding phase. After that, New York's prospects are shakier. We'd have to make a lot of progress in the indoor winter sports to match Boston's feat. Nets owner Mikhail Prokhorov has guaranteed a title in the near future, but that seems overly optimistic — particularly if he doesn't lock up Deron Williams beyond next year. And then there are the teams owned by Jim Dolan. The Knicks were swept in the first round this season and won't have Donnie Walsh in charge going forward, but they're certainly in better shape than they were during Isiah Thomas's tenure. The best-case scenario? Stoudemire and Anthony jell next season, get production from their supporting cast, and take another big step forward sometime in the next year or two — perhaps after the 2012 free-agency period, if the new labor agreement allows the Knicks to keep spending. That would given the team a window of two years until Carmelo Anthony's contract expires, and three until Amar'e Stoudemire's contract expires. After that, we could be looking at a different team. Meanwhile, the Rangers' window is even harder to gauge. Glen Sather's track record has been spotty — he's had better luck with trades than with big free-agent signings — and for more than a decade now, the team has settled for mediocrity. But the Rangers are in the midst of a rebuilding process, and over the past few years have developed a slew of homegrown players, some of whom have already developed into All-Stars (Henrik Lundqvist, Marc Staal), while others began to show promise last year (Michael Sauer, Derek Stepan, Ryan McDonaugh). Even adding Brad Richards to this mix this summer won't put the Rangers in the discussion for a title in the short term. Their best-case scenario? Holding on to the right young players, acing every trade, and hoping that the team continues to develop in a league in which so many of the game-changing talents are locked into their contracts for years to come. Can the Rangers build a Cup contender within, say, five years by following this plan, or some variation of it? It won't be easy. But having a reliable goaltender helps. Simply building competitive teams in all four sports is difficult enough — but to then have those teams survive in the playoffs and actually win the title takes a pretty incredible mix of management and ability, in four different organizations. 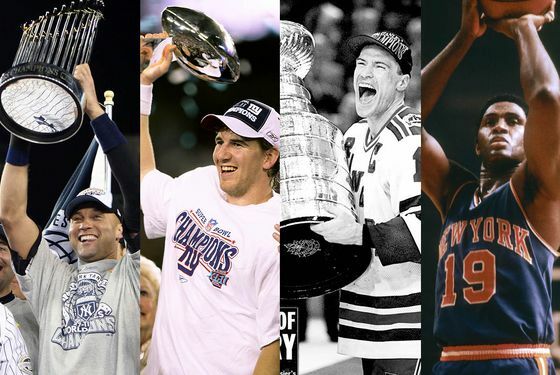 Maybe three or years from now, everything will align for New York, as it did between 1969 and 1979, when the Jets, Mets, Knicks, and Yankees all won titles, and the Rangers twice reached Stanley Cup Finals. And maybe James Dolan will suddenly become one of the smartest owners in sports. Gulp.